Forbes, J. M. 1985. Similarities and differences between intake control mechanisms in pigs, chickens and ruminants. 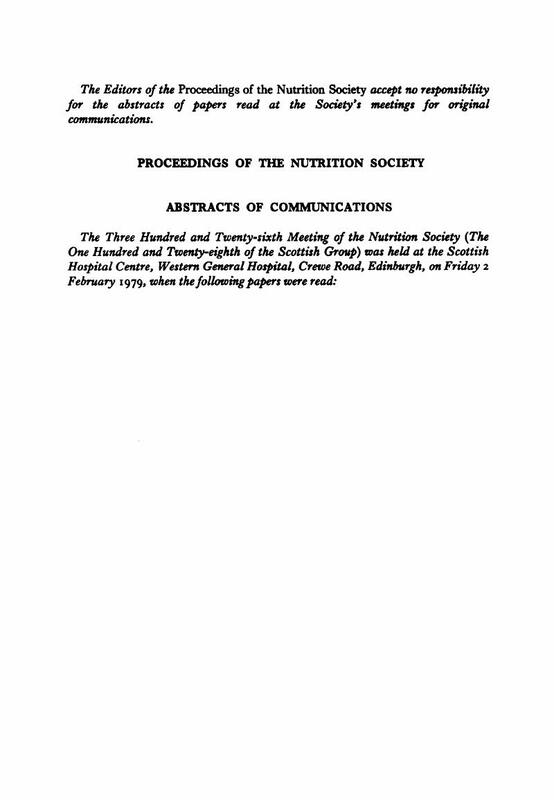 Proceedings of the Nutrition Society, Vol. 44, Issue. 02, p. 331. Heron, F. & Stephens, D. B. (1978). J. Physiol. 284, 14. Close, W. H. (1978). Br. J. Nutr. 40, 433. Emery, J. L. & Hilton, D. J. (1961). Acta paediat, Stockh. 50, 233. Ghosh, M. L. & Emery, J. L. (1970). J. clin. Path. 23, 599. Healey, J. E. & Sterling, J. A. (1963). Ann. N. Y. Acad. Sci. III, 25. McIndoe, A. H. & Counseller, V. S. (1927). Archs Surg., Lond. 15, 589. Raica, J. Jr., Scott, J., Lowry, L. & Sauberlich, H. E. (1972). Am. J. clin. Nutr. 25, 291. World Health Organization (1976). Tech. Rep. Ser. Wld Hlth Org. No. 590. Livingstone, R. M., Atkinson, T., Baird, B. & Crofts, R. M. J. (1977). Proc. Nutr. Soc. 36, 58A. Sandstedt, R. M. & Gates, R. L. (1954). Food Res. 19, 190. Whittemore, C. T., Taylor, A. G., Moffat, I. W. & Scott, A. (1975). J. Sci. Fd Agric. 26, 255. Kratzer, F. H. & Williams, D. E. (1951). Poultry Sci. 30, 148. Nachtomi, E. & Alumot, E. (1963). J. Sci. Fd. Agric. 14, 464. Department of Health and Social Security (1969). Report on Public Health and Medical Subjects, No. 20. London: HMSO. Felton, G. (1978). The cooking losses of vitamin C in food served in different kinds of hospitals. BSc Thesis. University of Survey. McCance, R. A. & Widdowson, E. M. (1969). Spec. Rep. Ser. med. Res. Coun. No. 297. London: HMSO. Kemsley, W. F. B., Billewicz, W. Z. & Thomson, A. M. (1962). Brit. J. prev. soc. Med. 16, 189. Bercovitz, Z. & Page, R. C. (1944). Annls. int. Méd. phys. Physio-Biol. 20, 239. Page, R. C. & Bercovitz, Z. (1943). Am. J. dig. Dis. 10, 174. McConnell, A. A., Eastwood, M. A. & Mitchell, W. D. (1974). J. Sci. Fd. Agric. 25, 1457. Ingenbleek, Y., Van Den Schrieck, H-G., De Nayer, P. & De Visscher, M. (1975a). Clinica. chim. Acta 63, 61. Ingenbleek, Y., Van Den Schrieck, H-G., De Nayer, P. & De Visscher, M. (1975b). Metabolism 24, 633. Peterson, P. A. (1971). J. biol. Chem. 246, 44. Jung, R. T., Shetty, P. S., Barrand, M., Callingham, B. A. and James, W. P. T. (1978). Proc. Nutr. Soc. 38, 17A. Suttle, N. F. (1974). Proc. Nutr. Soc. 33, 299. Suttle, N. F. (1977). Anim. Feed Sci. Technol. 2, 235. Tridot, G. & Bernard, J. C. (1962). Acta chim. hung. 34, 178. Kirchgessner, M. & Neesse, K. R. (1976). Z. Lebensmittelunters. U.-Forsch, 161, 1. Suttle, N. F. (1977). Trace Element Metabolism in Man and Animals-3 p. 473. [Kirchgessner, M., editor]. Weihenstephan: Arbeitskr. für Tierernährungsforsch.